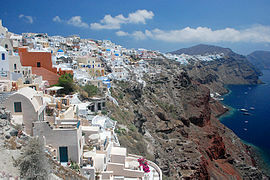 Santorini is effectively just a large volcanic rock of the South coast of Greece. It leads to stunning views and great places to sit and bask in the glorious sunshine (after you’ve whacked on the factor 40). It’s a holiday-makers dream, and to an extent it’s a winemaker’s dream too, but it does have a bit of a wind problem. No not that kind of wind problem. This wind problem has to do with the harsh gusts that fly off the Med and sweep across the often unguarded vineyards. Wise old heads came up with an amazing idea how to protect the grapes. 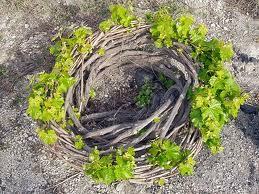 It’s something called KOULARA, and the vines are woven into a basket and the grapes grow inside the basket. Good idea, eh? For a wine to be called Santorini OPAP (Greece’s version of DOCG/AOC/etc) it needs to be made from 75% of our New Wine This Week grape, Assyrtiko. It’s a white wine, but the high summer temperatures and special growing method give it a great combo of high body, highish alcohol, and high acidity (basically just means it’s refreshing). That volcanic soil gives the wines a mineral flavour to go with the usual citrus tastes. The food pairings tomorrow kind of write themselves, but it’ll be with you either way. Looking forward to the drinking and eating already! 1: Santorini in all its glory! I have a genuine excuse for a Friday night kebab this week… its gotta be your food pairing… none of that Greek salad rubbish! I had grilled sardines and aioli in mind, but you may well have turned my attentions there! My wife and I honeymooned on Santorini and it was fabulous! I dragged her to a couple wineries and saw the Koulara system. Very cool! ← #NWTW Week 24: Winemaking in Greece, the Granddaddy of them all!